Instead of working on my WIPs, I’ve been playing around with different stitches and attempting to come up with combinations that look good. I decided to start with earwarmer patterns, since most of the country is colder than Antarctica at the moment! This pattern is a combination of floret stitches and back and front post double crochet. It’s fairly simple and it works up very fast. Enjoy! Row 2: Chain 1 (counts as a SL ST), *DC in the next stitch, SL ST into next stitch. Repeat from *. The last SL ST will be in the top of the turning chain. Row 3: Ch 3 (counts as 1 DC), *DC in the next DC, DC in the next SL ST. Repeat from *. The last DC will be in the top of the turning chain. Row 4: Ch 3 (counts as 1 DC), BPDC around the second DC (remember that the turning chain counts as the first DC), DC in the top of the next DC, *BPDC around the next DC, DC in the top of the next DC. Repeat from *. The last DC will be in the top of the turning chain. Row 5: Ch 3 (counts as 1 DC), FPDC around the second DC (remember that the turning chain counts as the first DC), DC in the top of the next DC, *FPDC around the next DC, DC in the top of the next DC. Repeat from *. The last DC will be in the top of the turning chain. 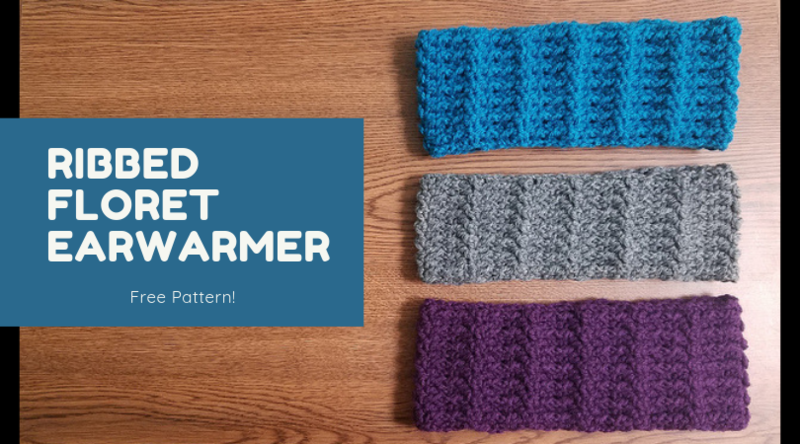 Repeat rows 2 – 5 until your earwarmer is the desired length. Whip stitch the ends together being careful to match up each stitch, so the seam isn’t too noticeable. I stopped after 49 rows (on a row 5), and I liked the way the seam looked.